Daily Illuminator: Play Ogre At PAX South And Get Exclusive Prizes! January 26, 2017: Play Ogre At PAX South And Get Exclusive Prizes! This Saturday, SJ Games will be at PAX South in San Antonio, TX, and we're bringing the Command Post with us! That's right, Ogre Sixth Edition will be in the house, and we've got some fun stuff planned for it. Not only will we be demoing the game at our booth (TT104), but we're also hosting an Ogre Sixth Edition tournament, this Saturday at 1:00 p.m., to see which commander will reign supreme! 16 players will battle it out over elimination rounds, until only one remains. Participants will be going home with unique swag, available for the first time at PAX South. 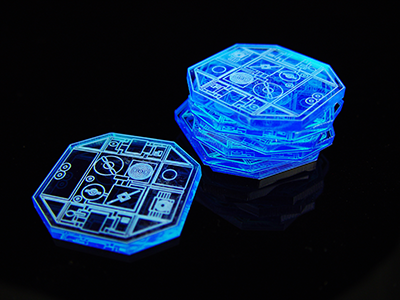 First, players will receive a Command Post in clear-blue acrylic, with etched details. This 2-D marker, which represents the 3-D tokens from Ogre Sixth Edition, is a thick, chunky little piece that makes a great centerpiece for a Pan-European defense. We'll also be giving out hard-to-find counter sheets for Ogre, with lots of units in alternate colors. Plus, the top four finalists will each walk away with a copy of Ogre Sixth Edition, ready to battle at home. For the winner, we have something a bit . . . bigger. 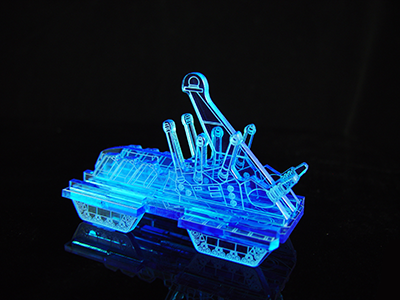 To commemorate this occasion, we've created an acrylic Ogre Mark V, scaled to use in Ogre! You could be the first and only (for a while) person in the world with this Ogre! This is the first time we've made these items, and we're excited to get them into the hands of some skilled gamers . . . but we don't know if or when we'll have more acrylic promos like this. So if you are at PAX South, sign up for the Ogre Tournament for your chance at these limited-edition goodies. If you can't attend, you can still participate and #PlayOgre at home! Share pictures on Twitter, Facebook, or Instagram this weekend with the hashtag #PlayOgre, and you'll be entered to win one of the acrylic Command Posts. One random winner will be drawn on Monday, so share your Ogre experience. We'll see you at PAX South!